Are you tired of the same routine? Its time to shake things up. Join us for a life-changing workout at Pole Fit Dubai. fly your way to fit! 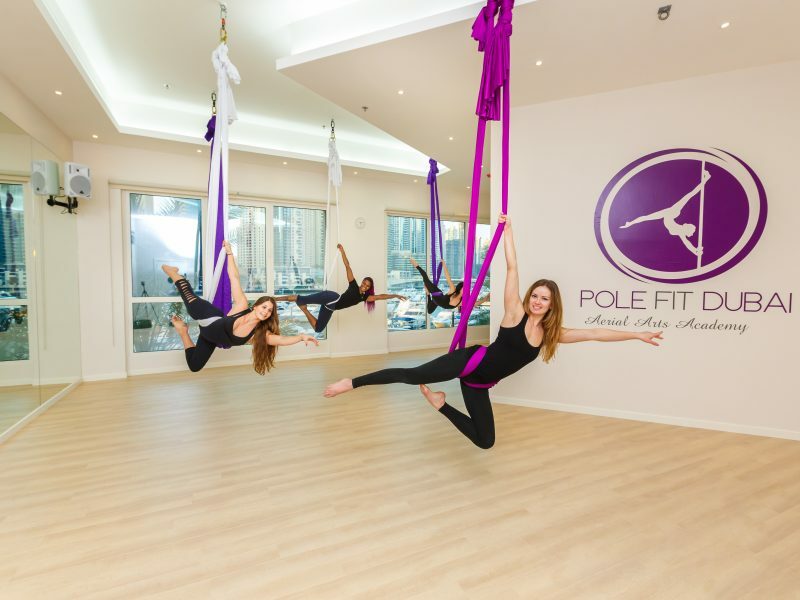 fitness, aerial hoop, silks, dance, stretch and lots more..
fun at Pole Fit Dubai! 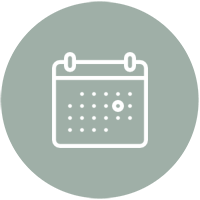 We would love to help you start your new life! Join us at Pole Fit Dubai and discover your passion today! Are you tired of the same routine? Its time to shake things up! 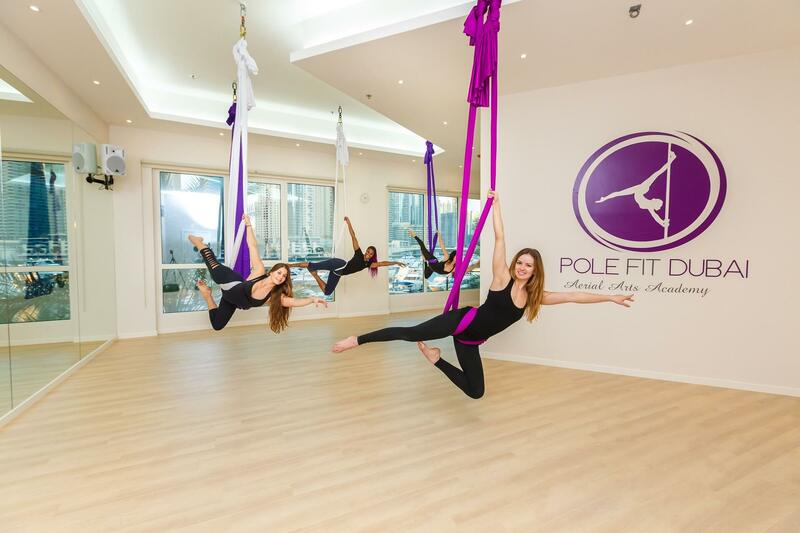 Join us for a life-changing workout at Pole Fit Dubai. Bored of slaving away at the gym, or running on a treadmill, counting down the seconds until you’ve burned enough calories to balance out your mid-afternoon sugar hit? Join the pole fitness revolution and put the fun back into your workout. 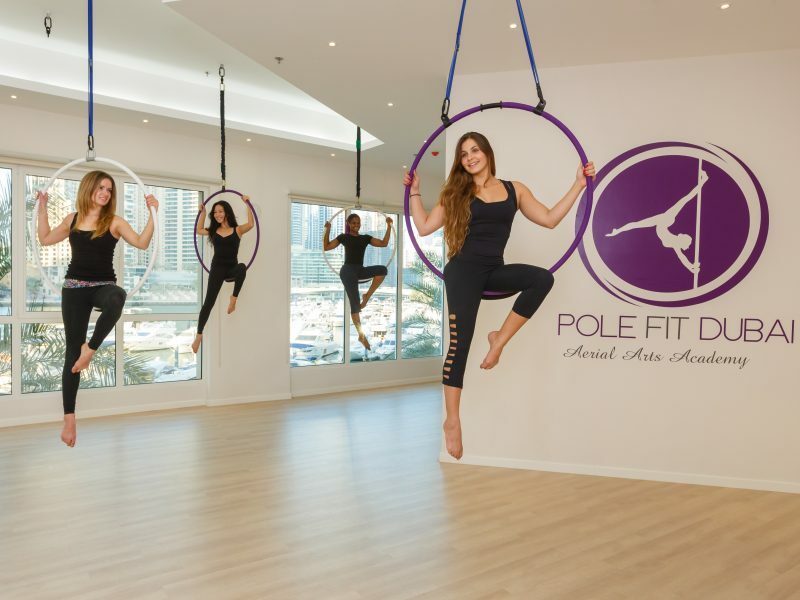 Swing, dance and fly your way to fit, trim and toned at Pole Fit Dubai – an aerial arts academy based in Dubai Marina offering classes in pole fitness, aerial hoop, silks, trapeze, hammock, swing yoga and lots more. 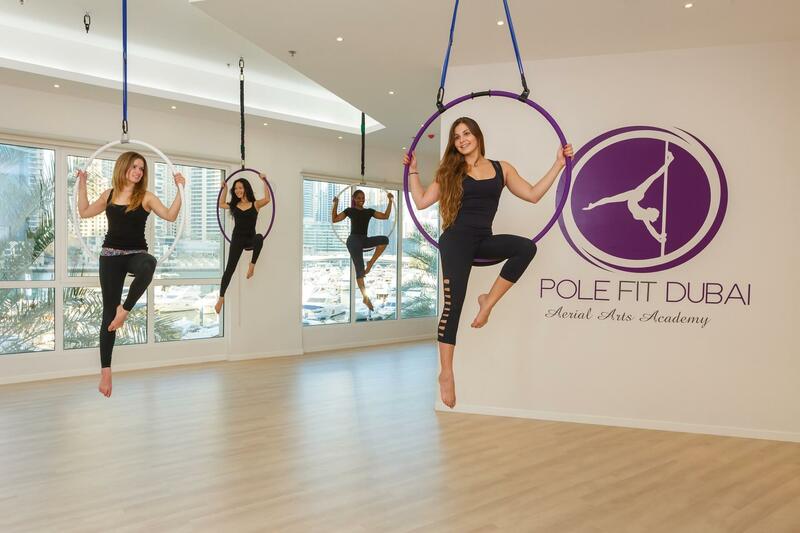 world of Pole Fit Dubai! We offer pole fitness classes for all levels starting from a basic level (Pole Intro) all the way to the most advanced (Level 4). 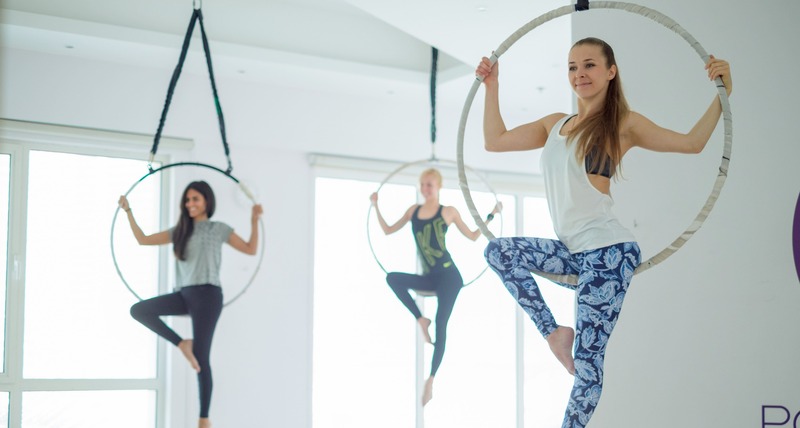 Our aerial classes include Silks & Hoop. All levels including complete beginners are welcome to try. Learn how to move your body with style, confidence and grace with our wide variety of dance classes. We offer unique stretch classes like no other, work deep into those muscles and be sure to get great results. 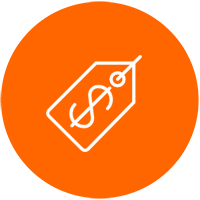 Check out our special offers this month! Or Take advantage of our monthly offers. At Pole Fit Dubai, our inspirational instructors are what sets us apart from the rest. All of our instructors are certified, highly skilled athletes, constantly improving themselves, and actively performing in the aerial community. While each of our instructors has their own style of teaching, they are all kind and welcoming, creating a warm atmosphere in class. I had never tried Pole before and I thought at my age (37) I was past it. Not only do I LOVE the classes, I have already dropped 4kg and feel so confident. I’m getting braver each class and have even attempted inverts. Thank you to all at Pole Fit Dubai. You are the best! I have never been so committed to one form of exercise in my life as I am with pole fitness. Since the day I started, I have been obsessed! I have been doing the body flex classes 2 times a week for about 6 months now, and I achieved my splits! I never in my life thought I would be able to do the splits. 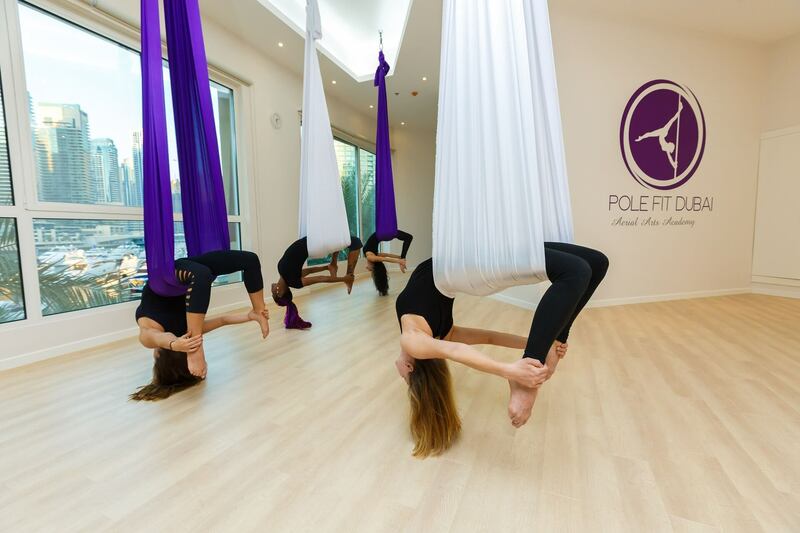 I just did my first Silks class at Pole Fit Dubai and I absolutely loved it! Being completely unfit and inflexible, I never imagined I would be able to do the things I managed to do today. I’m so happy! Don’t miss out on our specialty classes and workshops with some of the most elite athletes in the industry! 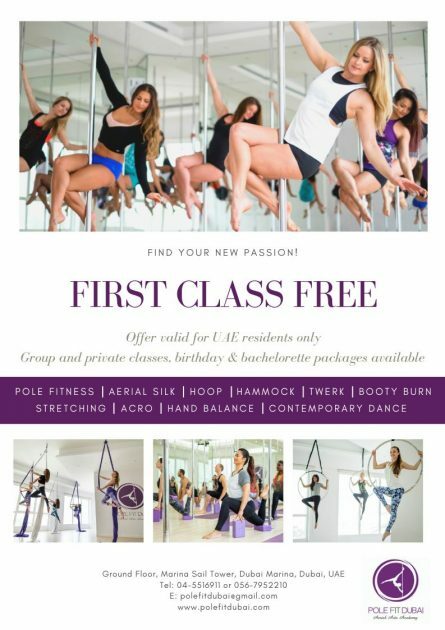 Pole fitness in a fun innovative way to get fit and lose weight as well as gain a new boost of confidence unlike any other form of exercise! You will be amazed to see how many muscles are used and how fast you can master the techniques and movements. Transform into the best version of yourself! 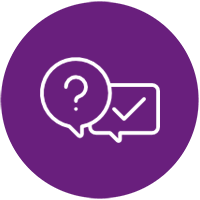 If learning in a group setting isn’t quite for you, we also offer private lessons one-on-one with our instructors. 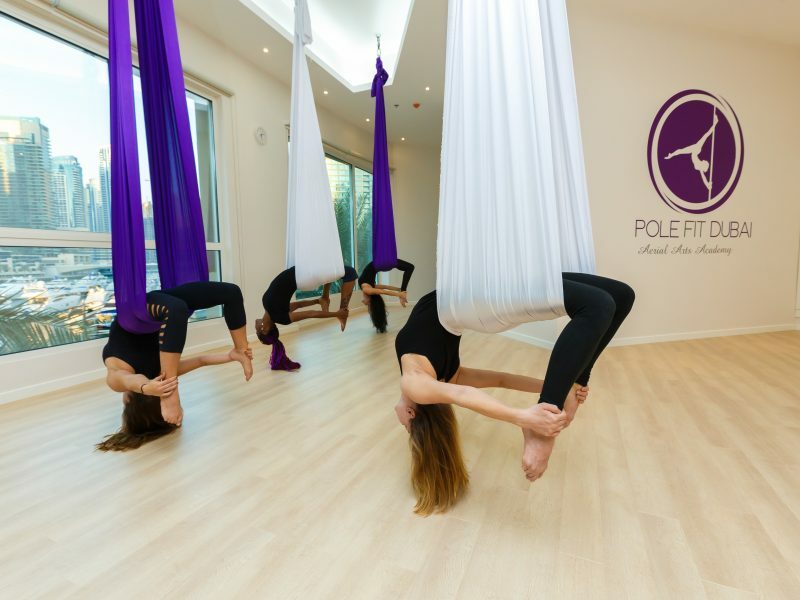 We offer beginner, intermediate and advanced pole fitness and aerial arts training, alongside a range of other dance and fitness classes as well as personal one-to-one private lessons. Having a party? What better way to celebrate and show your girlfriends a good time than to treat yourselves to an exciting party at Pole Fit Dubai. We host parties offering private pole, twerk, chair or burlesque dance instruction to your and your friends in our state of the art pole studio. Start today & Get PoleFit! Suitable for anyone who wants to get fit, gain confidence, express themselves and just have fun!